One of the most influential hockey people Windsor has ever produced, Bob Boughner has had great success on and off the ice. A great hockey player, successful businessman, and extremely influential Windsorite – Boughner is someone who sets a positive example for others to live up to and has brought great success to Windsor. Career totals: 630 Games played, 15 Goals, 57 Assists, and 72 points. True to his Windsor roots, Boughner played a rough blue collar game which saw him display the excellent leadership skills he would later bring to the Windsor Spitfires. A defensive stalwart, Boughner had an extremely successful NHL career. He began his career with the Detroit Red Wings where he played from 1991-1994. He would then move on to the Florida Panthers organization before making stops in Buffalo, Nashville, Pittsburgh, Calgary, and Colorado before his eventual retirement in 2006. Boughner has had considerable success leading the Spitfires, and his work has seen him recognized with great honours. 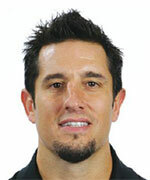 He has been involved with Team Canada and currently is an assistant coach with the San Jose Sharks. His work with the Spitfires continues, however, and no doubt Mr. Boughner will be involved in planning for a run at the Memorial Cup when Windsor plays host during the 2016-2017 season.